How does corset waist training really work? Does it burn fat cells or redistribute them? As I have thought about, studied, and discussed with many clients and corset enthusiast friends, plus read postings of others who pursue waist training, I have gradually shifted my thinking about what makes the process work for some but not for others. I have also considered those students who have come into my three-month coaching program and dropped out, or achieved less that both of us had anticipated in terms of weight loss, waistline inch loss, or both (yes, they are different and you can do them together, or one or the other while waist training). I’ve also thought about a few of my students and clients who have put weight back on over the years after losing it during formal corset waist training. I am SO happy. I have to say though that with the exercise it takes a bit more planning. I think I have to get to bed earlier so that I can work it in. Usually, I wake up and then all I have time for is some stretching otherwise , I exercise but then don’t lace up till much later. Two weeks ago we returned from a glorious camping vacation to celebrate my partner’s 50th birthday in Colorado. What a gorgeous state with friendly folk! 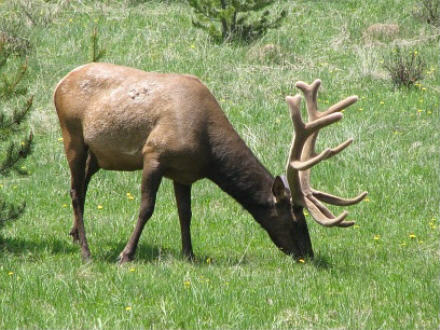 Yup that’s a visiting moose just a few campsites away, and a grazing, unconcerned Elk that about 30 of us gawking tourists photographed in Rocky Mt. National Park! Coming home I decided I didn’t want to end up looking like a moose, and that my partner and I had used the vacation plus too many other “special” occasions, to justify pigging out. It’s easy to get off track and ignore one’s expanding figure, tho we know better in our heads. And we had gotten off track. The first thing I decided to change was my behavior. I decided to plan for shopping and meals. I started pulling out recipes for healthy dishes, planned what to cook a few days in advance, and followed my plan. I set aside time while preparing dinner each day to prepare healthy snacks for my partner to take to work, in order to dissuade him from reaching into the work cookie machine for bad stuff. I also prepared enough of the snack to leave me some for the next day, too. We didn’t quit eating desserts, I just cut our portions way back, and also upped the amount of veggies on our plate. I read recently that half your plate should be veggies, 1/4 meat, and 1/4 starch. But I even excluded starch from three meals a week, and added fruit to our dessert menu instead of sugared sweets. So far, so good! Now we’ll see if we keep it up beyond two weeks! Yes, it takes time out of your busy day — getting a plan in place, then implementing it. It takes a decision to do so, and that decision requires the use of your logical mind and “nurturing” parent who cares about your health. It’s just that simple and also, that complicated. 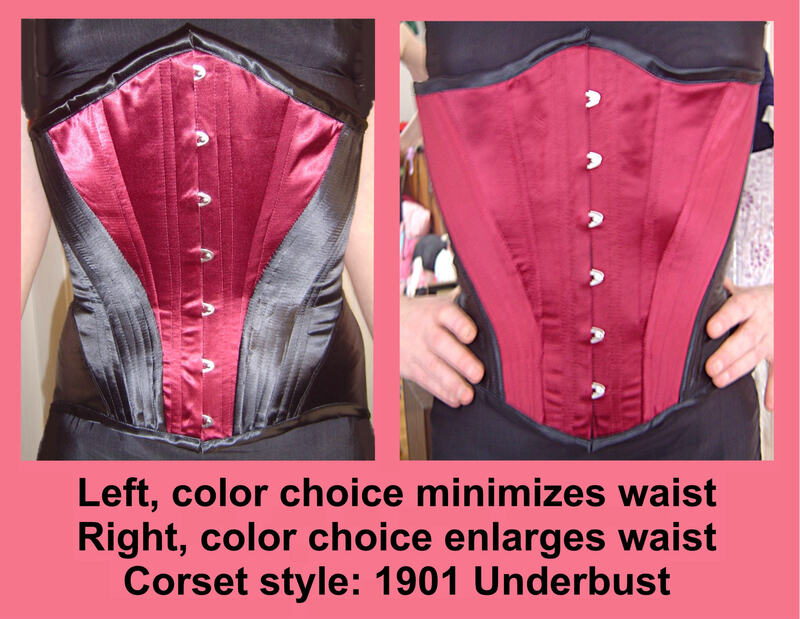 Part of evaluating the fit and quality of a new, or any, corset, concerns visual aesthetics. 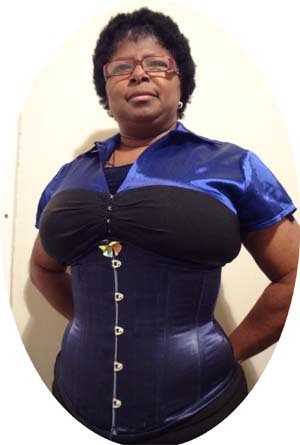 In a prior blog we have discussed quality and fit issues of adjusting the corset properly on your torso, and a bit about how to enhance your wearing comfort. In the future we will address other elements of fit and quality in order for you to evaluate a new corset. To begin, let me stress that in large part, visual aesthetics concern a matter of individual preference. What is considered artful or beautiful can differ dramatically from person to person. That is one reason why it pays to take your time and view as many of your chosen corset maker’s products as you can, in person if you can, but certainly thru closeup photos posted on their website. That is also one reason that you can’t just take the word of someone else, or a “Yelp” or “Angie” review as to whether this or that corsetiere is “good” or makes a quality, “beautiful” corset. Complaints that sometimes circulate about this or that corsetiere or this or that experience, should always be taken with a huge grain of salt. One person may have very low expectations as to neatness of their product, while another may be inclined to take a magnifying glass to measure the length of each stitch! Of course the latter practice is patently ridiculous, but trust me, I’ve had it happen on a few occasions over the past 23 years. 14. 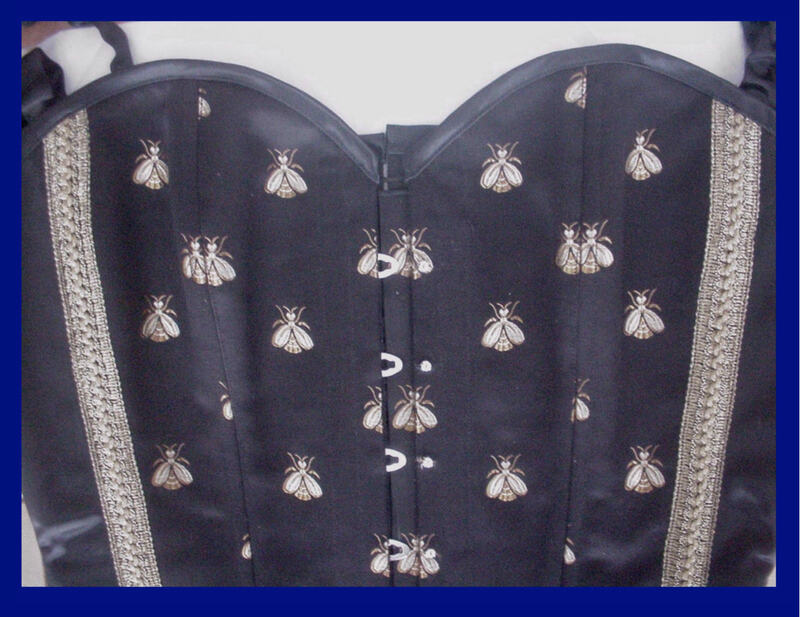 CORSET QUALITY STANDARDS (QS), & DETERMINATION OF PRODUCT DAMAGE: We take great pride in creating your product which is manufactured in the USA by seasoned artists. Our quality standards typically far exceed general industry standards. However, as with any hand-crafted product such as a Persian rug, you may find minor variations in handiwork between products, even between those made by the same corsetmaker or seamstress. Variances are to be expected & provide a unique aspect to each corset that we manufacture. Such uniqueness attests to the hand-crafted nature of your individual product, & it is greatly cherished by our clients. The same is true for custom garments. Consequently, we reserve the right to determine (1) if any alleged product defect falls outside of our QS or general professional standards in the field, (2) if damage is substantial & not just a minor aesthetic variance that lies within our limits of acceptability for quality hand-crafted products, or (3) if actual damage is from either client misuse contrary to the W&C Instructions or is indeed a true latent materials or construction defect. Variances may be seen in person at a Corset Salon/consultation or on our extensive website, or you may request our 14-page online standards list to review. Yes, in an excess of caution, I once prepared a visual of 14 webpages in case someone wants to really be quite sure of what they will be receiving, and the precise measurement standards or variations we apply at ROMANTASY for stitch lines, seaming width, binding and other. If you’re curious to see these pages, just send us an email. Some of the above topics are also related to durability, but some are purely aesthetic matters. Since these topics can get quite lengthy and every relevant detail can’t be covered, I’ll just do my best and deal first with fabric. I mention this because on some of the imported readymade corsets I’ve seen, the fabric may appear to be just fine, but soon enough with not much corset wear, especially if the corset is worn underneath clothing, the threads begin to spread apart and the fabric frays. It’s tough to say how long fabric should hold up and not fray or show signs of wear, but pictured right is a store-bought polysatin corset worn regularly as a foundation for over a year. The client wanted a particular color of gold, and so we consented to use this fabric since our cotton-backed satin in inventory, did not come in this particular shade of gold. But store-bought fabric frays and shows wear sooner than does the cotton-backed satin we recommend and use for many of our basic waist-training corsets. Satin is often chosen for foundation wear because clothing slips more easily over satin than over cotton which tends to “stick”. Yet satin will often “wrinkle” naturally and not lie smoothly on the torso (see the perfectly suitable and pretty pink and burgundy satin corsets by Sheri Jurnecka pictured below right). To some, this is objectionable, to others it’s a minor matter. Cotton corsets and sometimes cotton-poly blend corsets, tend to lie smoothly on the body. What do you prefer? “Hand” or feel of various textures of fabric varies, depending on what composes the fabric: satin, cotton, silk, polybrocade, and other, and type of each. Remember too, some corsetieres don’t work in a particular fabric even if you adore it. Sewing with or on different fabrics requires different types of sewing machines and equipment. Sometimes it’s just a matter of what fabric the corsetiere prefers to work with and how she (or he) wants corsets to look to represent their brand and business. I once sent a bride out to shop for her “ivory silk” yet she came back with black velvet! First off, velvets differ, some being cotton, poly blend, or silk and more or less suitable for corsets, and second, we had to change her corsetiere because the one she wanted to make her corset from our team, didn’t work in velvet at all! Don’t forget to consider binding that secures the top and bottom of your corset. It can be in the same fabric of your corset, or in a different one, including different in color. Note that the binding on Sharon McCoy Morgan’s standard overbust Victorian corset in ivory and royal lambskin pictured below, was simply the blue lambskin reversed! Binding can be patterned or not patterned (see the cute dark blue denim Edwardian corset by corsetiere Jill Hoverman pictured above using a red print cotton for the binding). 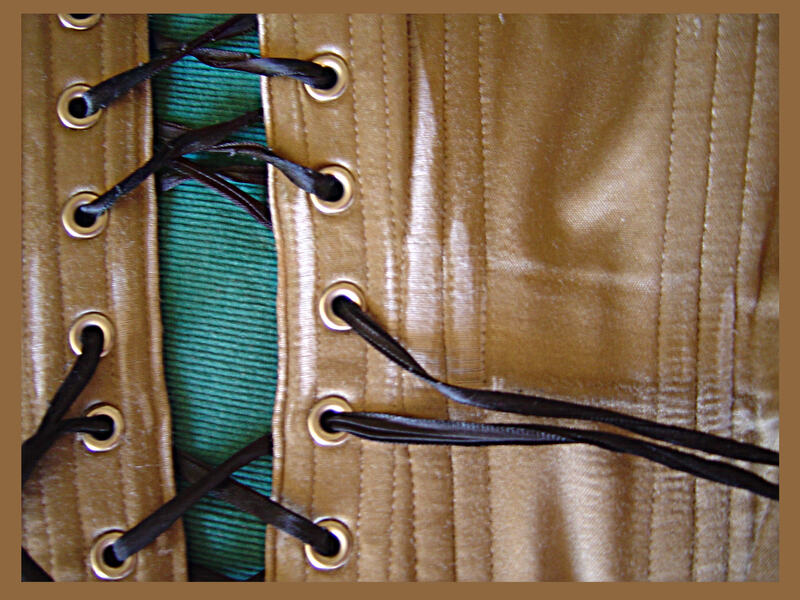 Some corsetiers offer only one type of binding, some offer more. I tend to like Petersham (ribbed) binding, but some don’t. Some adore the feel of slick satin or lambskin, but prefer it to be matte (a bit dull), while others love it shiny (the royal blue lambskin in Sharon’s corset is shiny). Some prefer the natural fibers such as rougher linen (no shine) or smooth silk duchesse satin (some shine; yes, it’s called ‘satin’ but is 100% silk! 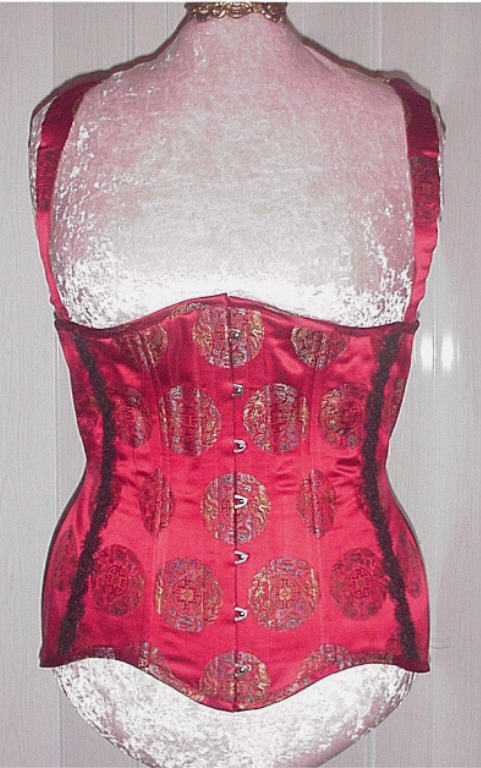 Go figure that one….you can see a scarlet silk duchesse satin-with-partial beaded lace-overlay corset by Sue Nice pictured to the right below). Cotton to some is boring as a concept for corsets, but I once found a lovely, slick ‘tuxedo’ black cotton that was quite soft to the touch and lovely to behold. Coutil 100% cotton also tends to be very soft to the touch but is quite expensive and most available in the marketplace is woven in and imported from England. Sadly, my local fabric store never replaced the tuxedo cotton I once found, so only one of our clients ever benefited by choosing it from a sample I sent her. Personally, I generally don’t like the “hand” or feeling of fabrics woven with lurex threads (that make a corset glitzy or shiny looking), and a smooth touch is important to me. 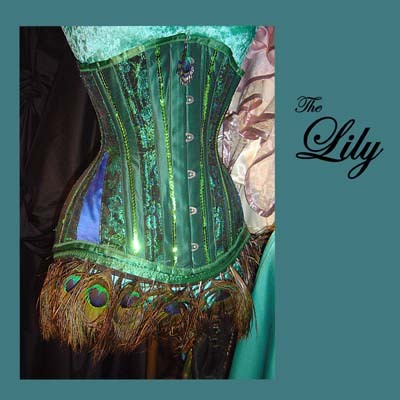 When I use a fabric with lurex threads in my corsets, I normally limit the amount of that fabric, as in my spectacular blue and green peacock feathered Lily corset by former ROMANTASY corsetiere Michael Garrod, pictured here. Only certain panels used the lurex-threaded fabric while others use silk or satin. How about to you? Let your corsetiere know! More than once I have had a client bring me fabric that has a large repeating pattern on it. I mean by that, if it has a rose (or a small bee or a large circle seen in the examples to the left and right below), each rose is about 2″ across and repeats. Or they bring a smaller rose pattern with the roses very widely spaced with lots of plain, unpatterned fabric between. Note that corset pattern pieces are each quite narrow, especially at the waist and especially for slim tight-lacers. Where the corsetiere places each pattern piece on a repeating patterned fabric can completely avoid showing a single rose in the above examples–unless you request your corsetiere to employ what I call “mirror matching” or if she does it automatically as standard practice. That means that they do their best to even out the pattern and make one rose appear on one side and a mirrored rose to appear on the other side of your corset. Note how the bees and the circles are matched both vertically and horizontally in the black and the red silk corsets both by our corsetiere Sue Nice. Note she even matched the bees in her underflap under the busk. She is a true mistress of precise artistry when it comes to mirror matching! But do you want the rose (or circle or bee) to appear at your waist, at the top, or at the bottom of your corset? Speak up! If you don’t specify, the corsetier will, and fairly so, just use his own opinion, and it might not be your opinion or what you envision. In the case of mirror matching, it take s more time and talent to lay out the pattern, and it requires up to twice as much fabric with a good bit of fabric waste. Some corsetiers may include an upcharge for the additional labor and fabric involved, so be sure to ask when you place your order. If you are shopping for your own fabric, be sure to purchase double what you might otherwise provide, just to be safe. I’m sure there are many more relevant comments regarding this topic of quality in visual aesthetics, so please feel free to comment on what you consider to be “beautiful” in your corset fabric. We’ll discuss embellishments later.